Our Chefs and Wellness Coaches are Health Experts. Our Culinary Experts can help YOU discover some of the most important foods for a healthy diet and improved lifestyle. Our wellness coaches help people improve their health and well-being, in an extremely personalized way. Usually people come to a wellness coach because they are struggling with something that is hurting their well being, like stress, weight loss, life balance or energy. We help people overcome the struggle; build skills such as self-motivation, self-awareness, confidence and resilience; and make changes that are sustainable. Often, people try lots of quick fixes and find they do not stick. Our wellness coaches are skilled at getting people to a better place where a new lifestyle sticks. We can help you achieve positive goals. Contact us by E-mail here chefdepot@gmail.com for personalized training packages. One of the most basic facts to remember - the darker or richer the natural color foods are better for you. Less processed foods are always better for you than highly processed foods. Below is a list of Super Foods that we like to eat often. There are many others too! Garlic - Fights off misquitos and it's good for your blood system, we always keep minced dried garlic, in the cabinet so when we run out of fresh garlic, we can still add it to pasta salad and marinara sauce. 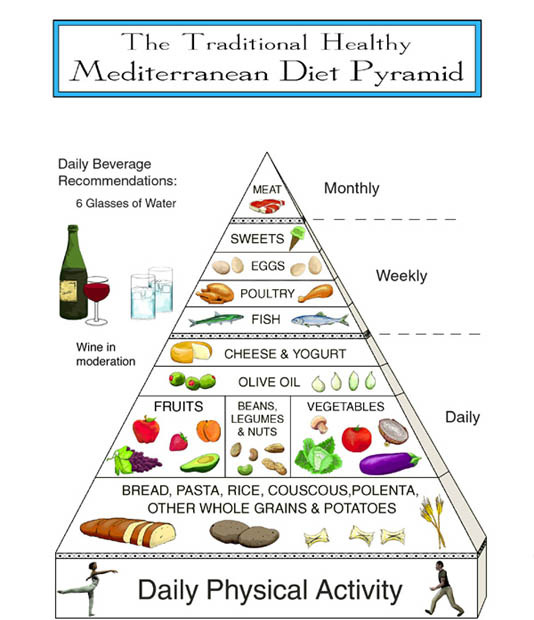 More ..
Pictured are three Food Pyramids, USDA, Mediterranean & Atkins. Which is best for you? Contact us to help you to live healthier & longer.